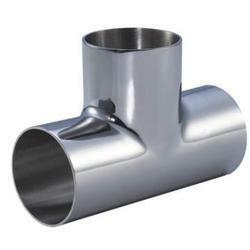 Our product range includes a wide range of ss pipe tee and four way tee pipe fitting. Due to our enormous understanding and massive knowledge of this business, we are involved in offering SS Pipe Tee. These products are made from high quality components. And, these are used as pipe fitting purpose. In addition, the offered range marked at the most reasonable rate possible, its demand is quite high. These are available at very nominal price rates in the market. We offer comprehensive range of Four Way Tee Pipe Fitting that are available with us in various sizes, forms and grades as per the demands of the clients. Used in different Sewerage drainage or Cable networks. Offered range is widely demanded in the market owing to diverse significant attributes. Owing to the attributes such as high rigidity, excellent finish and resistance against corrosion, the pipes cross is widely applauded in this highly competitive market.